Years ago, people ate butter with their breakfast, lunch and dinner. They knew it was a delicious condiment but didn’t yet realize its health drawbacks, such as its high amount of cholesterol and saturated fat. Now that people are more educated in all aspects of nutrition, there are many butter-alternatives on the market that claim to have less cholesterol and saturated fat. It is important to watch your cholesterol, because high cholesterol levels can lead to increased risk of heart attack, according to the Cleveland Clinic Miller Family Heart and Vascular Institute. According to the Harvard School of Public Health, cholesterol is a compound naturally made by all humans and animals, as it is an essential precursor for hormones like estrogen and testosterone. Since cholesterol is made by animals, all animal products such meats and dairy have cholesterol as well. Though we don’t need to eat any extra cholesterol, a small amount in the diet is not harmful. The Cleveland Clinic Miller Family Heart and Vascular Disease states that people should eat no more than 200mg of cholesterol each day. Since butter is an animal product that comes from milk, it contains cholesterol. The Cleveland Clinic Miller Family Heart and Vascular Institute states that there are about 33mg of cholesterol in 1 tbsp. of butter. If you use butter several times a day, or eat out often, you may be consuming more cholesterol than you think. Butter is often used in restaurant meals to enhance the flavor. Furthermore, the combination of meats, milk and eggs, along with eating butter, can make your cholesterol levels dangerously high. 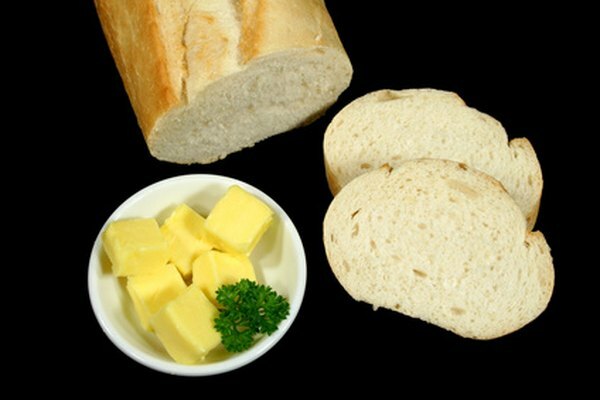 Besides the cholesterol in butter, there is another reason for limiting your use of butter, which is the saturated fat. A single tablespoon of butter has 7g of saturated fat. The Cleveland Clinic Miller Family Heart and Vascular Institute states that saturated fats, also found in all animal products, increase the unhealthy LDL levels of cholesterol in our body. The clinic recommends that adults eat a maximum of 10 to 15g of saturated fat each day. Dietary cholesterol should be limited because it can clog the arteries over time, states the Cleveland Clinic Miller Family Heart and Vascular Institute. The Harvard School of Public Health states that the intake of cholesterol and saturated fat are associated with cardiovascular disease as well as osteoporosis and even infertility. Another correlation, according to the Harvard School of Public Health, is that people who eat more cholesterol usually eat more calories and have greater risk of becoming obese. Since butter contains cholesterol and saturated fat, which can raise cholesterol levels in your body, it is a good idea to use a butter alternative. The Harvard School of Public Health states that though margarine contains unsaturated fat, which is healthy, margarine in stick form also contains trans fat, which is very bad for the heart. The school recommends purchasing a soft, spreadable margarine in a tub that contains cholesterol-lowering plant sterols and no trans fats.